Ahhhh Spring… The birds are chirping, the flowers are blooming and my thoughts have turned to planning my vegetable garden. For me there is nothing more satisfying than tending, harvesting and enjoying veggies produced in my own little backyard. Part of what appeals to me most about vegetable gardening is the sheer possibility. The possibility that you’ll have a bumper crop of string beans and become this summer’s “String Bean Queen”, the possibility that you’ll plant the eggplant too close to the yellow squash and create some crazy hybrid vegetable and even the possibility that the pumpkin you and the kids were so excited to grow, ends up a total bust. How I love the daily nurturing and fervent watching for the slightest growth, flower and finally fruit. It gives me such joy! Long before I ever had actual raised beds to plant in I was an avid container gardener. Then it was mainly the growing of herbs, tomatoes and a little lettuce that made me happy. I used those early garden successes in every fashion I could think of, but more than just about anything else I made pesto. Tons of pesto in fact; traditional basil and pignoli, kale and toasted walnut, mint and almond and even arugula and pistachio. I was “The Pesto Queen”! 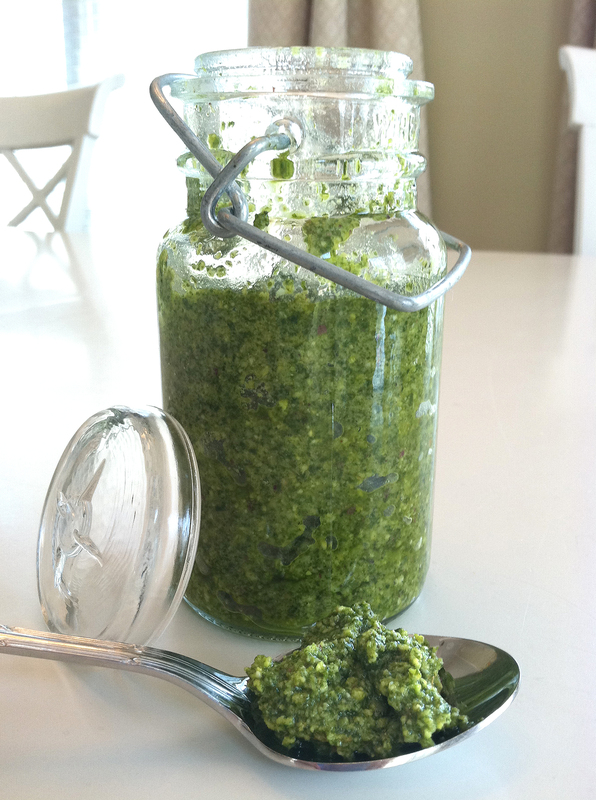 Pesto is one of the most versatile sauces I can think of. It’s great as a spread on crackers or sandwiches, yummy mixed with some Greek yogurt and served with raw veggies, makes a tasty salad dressing when thinned out with additional lemon juice and oil and can even enliven a simple bowl of minestrone soup. But the thing that I truly love the most about pesto is that it tastes just like Spring. Fresh, green, unhurried and full of promise. 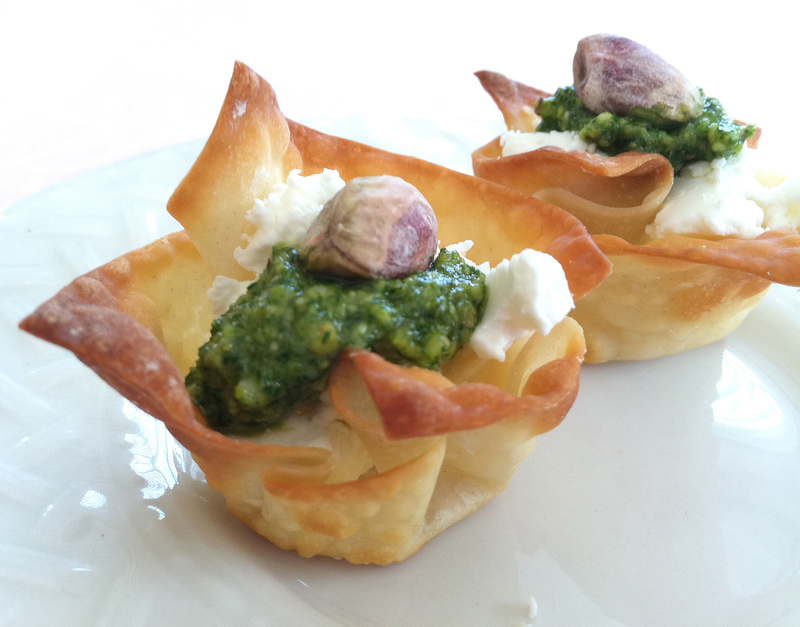 This pesto is fantastic just about anywhere, but particularly good as a sassy little appetizer with goat cheese and won ton wrapper cups (see recipe below). Boil six cups of water in a medium-sized pot. *Working in small batches, quickly blanch arugula and then shock it in a bowl of ice water. Wring the blanched arugula dry and place in a food processor. Add the olive oil, lemon juice, pistachios, garlic, grated cheese, salt and pepper. Pulse until smooth. Season to taste with additional salt and pepper. If the pesto is too thick add a bit more oil and lemon juice. Use immediately or store refrigerated in an airtight container. *I always blanch whatever type of green I’m using to make pesto. You don’t have to, but it helps keep your beautiful pesto bright and green, rather than turning brown in a day or two. These are a snap to make but look like you’ve toiled for hours. Preheat oven to 350°F. Spray a mini muffin pan with cooking spray and gently mold the wonton wrappers into each cup. Then lightly spray each raw wonton cup with the cooking spray. Bake the wonton cups for about 6-7 minutes, until they turn a light golden brown. Remove the baked cups from the muffin pan and allow to cool for a few minutes before filling. Fill each cup with a square of goat cheese, a 1/4 tsp. of pesto and garnish with a pistachio. Next wonton soup… who knew?!? We enjoyed these morsels as an appetizer on Easter and they were delicious!! So simple and so flavorful who could ask for more!! I highly recommend you give this a try! !